Location: At the junction of the A494 and the B 5429, set within its own walled churchyard. 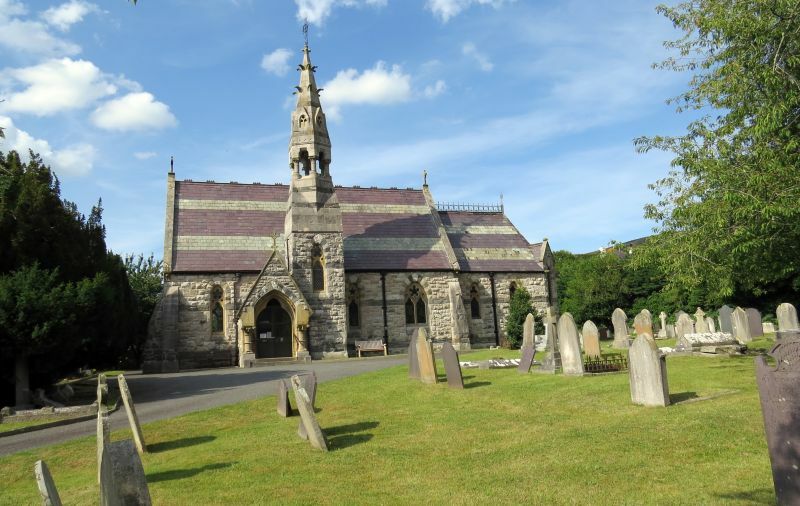 Parish church built in 1863 for John Jesse, FRS, of Llanbedr Hall, to replace the medieval church 400m to N. The architects were Poundley and Walker and the contractor was James Porleys. Victorian parish church in Early English style, comprising nave and chancel, S porch with attached bell turret and a vestry adjoining the chancel to the N. Of pale grey, rock-faced stone with darker stone banding (pale and dark stones alternate in voussoirs), bathstone dressings and plate tracery. Original purple slate roof with grey slate bands and terra-cotta ridge tiles to the nave (stone wheelcrosses to gables); wrought-iron brattishing with wheelcross to chancel. Nave of 4 bays with alternating one-light and 2-light plate tracery windows (foiled heads); stepped buttresses to ends. The S porch has a steeply-pitched gable and a pointed-arched doorway with trefoil head. Flanking this are stumpy columns with heavy foliated capitals; circular foiled window to W side. Wire bird doors to porch, with red/black counter-changed pavement; chamfered, broach-stopped inner entrance arch, with double boarded doors and decorative ironwork. Immediately R of the porch is a square turret with octagonal open bell stage, whose stumpy columns support a spire with lucarnes and crockets, topped by a wrought-iron wheel cross. W window of 3 lights; plate tracery with foiled head. The chancel has 2 single-light windows to the S, and a polygonal E end where single-light windows rise above the eaves; these have gables flanked by gargoyles. Adjoining the chancel to the N is a vestry with steep, hipped roof. Pointed-arched entrance with boarded door to the W, approached via 3 steps. Plain 2-stage chimney to the N, and 2 square-headed windows to the E.
The original cast iron downpipes and hoppers survive, the latter dated 1863. Four-bay aisleless nave with scissor-braced roof trusses, alternately arched-braced and supported on foliated stone corbels and tiny columns with shaft-rings. Original grained pine pews with simple decorative pew-ends; central black/red patterned pavement. Perpendicular-style octagonal font of painted stone; of conventional type with moulded plinth, octagonal base and bowl with blind tracery panels to each face. Perpendicular-style octagonal pulpit of grained pine on an octagonal stone base, with tracery panels to the main faces. Wooden stepped access on the N side with columnar balusters. Stepped-up chancel with large chancel arch, having moulded and hollow-chamfered detail with ball flower ornament. Wooden compartmented waggon roof with diagonal bracing and carved foliate bosses at intersection points. Vestry doorway, on the N side of the chancel, deeply-recessed shouldered arch with flanking stiff-leafed capitals. Tympanum with marble dedication plaque recording the erection of the church in 1863 under the patronage of John Jesse (of Llanbedr Hall); this also includes the names of the architects (Poundley and Walker) and the contractor, James Porleys. Adjoining the vestry doorway to the W, on the N side of the chancel, is a wide, moulded arched niche occupied by the organ. This is of oak, in simple French Renaissance style. To the L of the chancel arch is an associated Early English style wrought iron grille to the organ chamber. Original choirstalls with raised and fielded, cusped, multi-panel fronts and carved foliate decoration to the bench-ends, with supporting ringed shafts. Simple oak altar rails to stepped-up sanctuary, supported on partly-gilded, wrought-iron tracery piers. Encaustic tiled pavement by Maw and Co.
Monuments: Nave, S wall (E-W): mural monument to Edward Lloyd of Berth and Rhagatt, d.1859; by John Gibson, RA, signed and dated 1863. Grey marble tablet with arched top and a relief profile in white marble, set within a recessed roundel. Next is a large classical monument to Ursula, wife of Hugh Lloyd of Berth, d.1795, removed from the old church of St Peter and re-set here presumably c1863; by S and T Franceys of Liverpool. The monument consists of a white marble tablet with moulded cornice and a surmounting sculpted figure of Faith; shallow obelisk behind, of dark grey figured marble, and a shaped grey marble apron with wreathed heraldic roundel. Finally is a large grey marble benefactors' board on a black marble background, dated 1787; this again originated in old St Peter's. Nave, N wall (all removed from the old church): simple classical monument in white and grey marble to Joseph Ablett Esq, of Llanbedr Hall, d.1848. Next, a Grecian mural tablet in white marble to John Jones of Jesus College, Oxford, Archdeacon of Meirionedd, d.1835; this has a surmounting draped and gadrooned urn with a black marble obelisk behind. Finally, a simple tablet to William Greene, Rector, d.1782, together with his wife Sidney d.1798 and later family members (erected 1823). In the porch is a particularly fine early C14 sepulchral slab fragment, found at the old church within recent years. Stained and painted glass: the chancel E windows are contemporary with the building and are fine figurative panels by Clayton and Bell. The W window is in early C13 style and shows scenes from the Passion. The nave N windows are firstly a fine memorial window of 1886 (in memory of Jane Bacon) and (to the W) a memorial window of 1918 to Dr G Crace-Colbert; the nave S windows are by Shrigley and Hunt, 1898. Graded II* as an excellent example of a small mid C19 Gothic revival church, with high quality design and detailing, largely unaltered, and substantially complete in its furnishings and fittings. Located in the churchyard, approximately 20m W of the church. On the road-side in the centre of the village, opposite the Church of St Peter. Located at the SW entrance to the churchyard. Prominently-sited on a bend of the road in the centre of the village group, opposite the church. Set back to the E of the main road at the approach to Llanbedr village. Also called Maenor Plas Isaf. Located at the lower (south-western) end of the garden at the Old Rectory. Set in its own grounds approximately 0.5km NW of Llanbedr Dyffryn Clwyd, with drive entrance close to a bend on the road.